All-terrain vehicle (ATV) accidents are far too common in the United States. Injuries suffered in off-road vehicle (ORV) accidents are usually severe and fatalities number in the thousands. Even more disturbing is that many of the victims of ATV accidents are children and teens. If you have been injured or lost a loved one in an ATV accident caused by someone’s negligence or faulty equipment, contact a personal injury lawyer at Thurswell Law. Three-wheel or four-wheel ATVs or ORVs, including amphibious vehicles, are motor vehicles that have the capability to travel on all types of terrain, including land, water, sand, snow, ice, and swampland. Designed for off-road use, these machines have low-pressure tires and seats that are designed to be straddled by the rider. Inexperienced riders: For some people, ATV riding is family tradition. They live where ATVs are common, they use ATVs to get around their property, and ATV-riding is a normal part of fun and recreation. Some children grow up riding on ORVs and can’t wait for the day when they can operate one or even have their own. This familiarity with such powerful machines can lead to risk-taking where there should be none. Just because children have seen ORVs and how they are operated, that’s not the same thing as safely managing the vehicle on their own. Daredevils: Risk-taking is part of the fun for some ATV riders in Michigan. Using an off-road vehicle for anything beyond its intended purpose, however, can lead to tragic consequences. Without proper training, practice, and experience, one innocent ATV ride can turn disastrous, harming and even killing machine operators, passengers, and innocent bystanders. Intoxication: You don’t have to be driving a car to get a DUI in Michigan. Drinking and operating an ORV or ATV is the same as drinking and driving a car. While no ATV rider should be on the roads, avoiding drinking and driving an ATV is common sense. Any heavy machinery that is being operated by someone who is intoxicated makes accident an injury far more likely. Improper gear: Protective gear is recommended for ATV riders. Crash-tested helmets and goggles should be a non-negotiable but, sadly, many people don’t consider helmets a necessity if they’re just taking a spin around the yard or going for a leisurely trail ride. It’s essential to always take safety precautions. There is no way to predict when an ATV accident will occur. Who Is Responsible for a Michigan ATV Accident? If an ATV accident causes injuries or death, the question is: Who is responsible? Did the property owner fail to maintain a safe riding area? Was the ATV faulty and therefore the all-terrain vehicle manufacturer is at fault? Did the actions of another ORV operator or the driver of a motor vehicle cause the crash? Is the ATV operator to blame if the injured person was their passenger? Serious, catastrophic injuries can result from an ORV accident, including traumatic brain injuries, spinal cord injuries, amputation, damage to internal organs, fractures, and death. 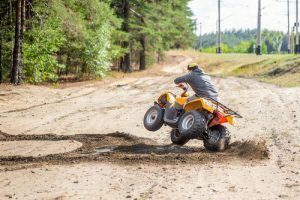 Any off-road vehicle accidents that involve reporting the crash to an insurance company to collect compensation calls for the help of an ATV accident lawyer. In some situations, the Michigan no-fault law kicks in to help you secure compensation. You need someone to negotiate on your behalf, so you get financial help for medical care, lost wages, and attendant care costs from your insurance company. If you have been involved in an ATV accident caused by someone’s negligence, or if you have lost a loved one in a preventable ORV accident, contact Thurswell Law for a free consultation. We don’t charge any fees unless you collect. Call (248) 354-2222 today.